For those who travel through North Carolina’s Rowan County in the fall, it is easy to notice the variety of crops ready to be gathered: soybeans, cotton, and feed corn. Cotton is especially stunning in its final stages before harvest. Rounds of soft white are resting on tall stalks so densely packed in the field that the soil cannot be seen. However, the soil is good. It must be good to host such an important crop. In chapters four through sixteen of Luke’s Gospel, Jesus is on the move bringing living words through healings, miracles, and holy conversations. And Jesus is teaching. In the early verses of chapter eight, he offers the Parable of the Sower. He speaks of seeds spread upon a path, trampled and eaten by birds. Other seeds that fell upon rock and among thorns suffered a similar, non-fruitful fate. But the seeds that fell on good soil produced far beyond expectation. 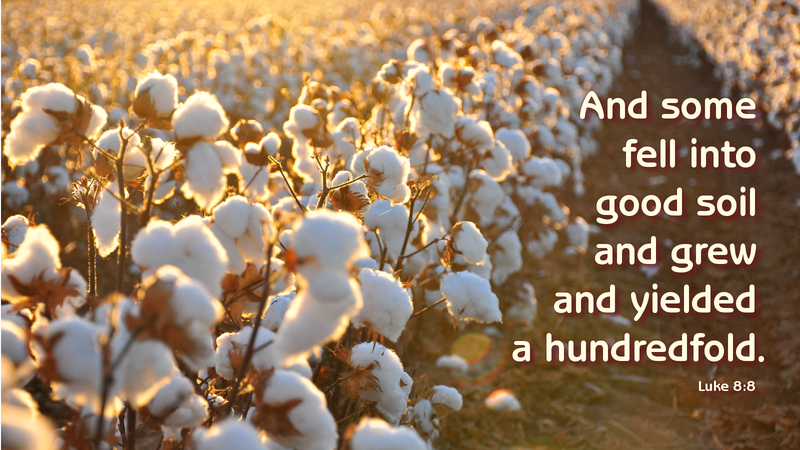 The cotton harvest in our area will only be as rich as the soil that embraces it. Through Jesus Christ, God provides his living word for us that is ours to receive. That word, finding a place within us, is faithfully seen in our words, deeds, and our thoughts. In Christ we have a living faith and we are called to bear fruit in every season. Prayer: We praise you, O God, from whom all blessings flow. Amen.